“To say [the documents of Vatican II] are not binding is sophistry. The Council contains swathes of the ordinary magisterium, which is de fide divina [of divine faith]. Is Archbishop Di Noia saying that Vatican Council II is in agreement with Tradition; with the dogma extra ecclesiam nulla salus as if it was interpreted by the Church Councils and popes ? Nowhere in Tradition is it stated that there are known exceptions to the dogma, no magisterial document including Vatican Council II states that the dead now saved in invincible ignorance and the baptism of desire are visible to us. Since they are not visible to us they are not exceptions to the traditional interpretation of the dogma defined three times. 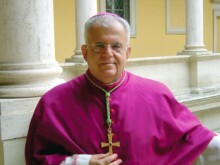 Archbishop Di Noia does not know any person who does not need to enter the Church. If he does he should name this person whom he is sure will be saved without the baptism of water and Catholic Faith. So is Ecclesia Dei now saying that Vatican Council II affirms the traditional teachings of the Church on other religions and ecumenism? This would mean the Council is in agreement with the Society of St.Pius X's traditional interpretation on other religions and ecumenism.This is a big breakthrough. Could Fr.Thomas Rosica at the Vatican Press Office clarify if this is the understanding of Ecclesia Dei and the Congregation for the Doctrine of the Faith ( CDF) on this issue? This would also mean that Vatican Council II(AG 7) is saying all atheists need to enter the Church with 'faith and baptism' for salvation and there are no known exceptions.LG 16 is not an exception since being saved in invincible ignorance or a good conscience are not visible to us cases. LG 8 is not an exception to AG 7 and the dogma on salvation, since being saved with 'elements of sanctification' is invisible for us.So it is irrelevant to the traditional teaching on salvation. Would this also be the interpretation of Vatican Council II by Pope Francis ? This would be his interpretation of the Council in inter-religious dialogue ?. It would be saying that Jesus cannot be found outside the Catholic Church and to be saved by Jesus all need 'faith and baptism'. Just faith in Jesus would not be enough, but faith in Jesus within the Catholic Church, as a visible member of the Church and living the Gospel as interpreted by the Catholic Church. Does Vatican Council II say that all need to be a visible member of the Catholic Church for salvation? Yes. Visible Catholic Faith which can be affirmed and tested and repeated and visible baptism of water. Re: Could Fr.Thomas Rosica at the Vatican Press Office clarify for the SSPX if this is the understanding of Ecclesia Dei and the Congregation for the Doctrine of the Faith ( CDF) on this issue? Lionel A wrote: Does Vatican Council II say that all need to be a visible member of the Catholic Church for salvation? Yes. Visible Catholic Faith which can be affirmed and tested and repeated and visible baptism of water. Does it matter if a Baptism is not public? What would have happened if Osama bin Laden's babysitter had baptized him when he was only six months old? Would he not have been a full-fledged member of the Mystical Body of Jesus Christ, which is the Catholic Church? But, we're back to "proving negatives" again, aren't we?! Vatican Council II indicates it is visible. This is important. Does it matter if a Baptism is not public? It is not just Fr.Leonard Feeney saying that every one needs to be a visible member of the Church for salvation. What would have happened if Osama bin Laden's babysitter had baptized him when he was only six months old? Would he not have been a full-fledged member of the Mystical Body of Jesus Christ, which is the Catholic Church? If this was true it would be irrelevant to the dogma which says all need to convert. Al need to convert in the present times. Since we cannot convert in theory. It is not a contradiction to Vatican Council II which says all need Catholic Faith and the baptism of water. Both visible. While Osama's case is invisible to us.It would only be known to God. But, we're back to "proving negatives" again, aren't we?!. How could anyone ever "prove" that Osama bin Laden was never sacramentally baptized in his infancy as "anyone whatsoever" (Lateran IV, Canon 1) can baptize? So it's irrelevant to the dogma? How could anyone ever "prove" that Osama bin Laden was never sacramentally baptized in his infancy as "anyone whatsoever" (Lateran IV, Canon 1) can baptize?. However, just because the Triune God can do something does not mean that He will do something, even if such results in a soul being saved from eternal Hell. We ought never to presume that such divine graces are going to be available to anyone and everyone to an unlimited degree and extent. To me, such a view is a sin of presumption and is a widespread error within the modern-day Church. It is to know or presume to know that which one cannot know. So much of your former discussions and those of others were irrelevant to the dogma. So it's irrelevant to the dogma?. No, absolutely not. If Osama bin Laden went to Purgatory and not Hell, it was because he ended his life in "the bosom and unity of the Catholic Church." Ever hear of the Emperor Trajan? You have agreed before that we do not know any one in Heaven gone there in 2013. We cannot see them physically. We do not know if this case (Osama) is in Purgatory or Hell. So it does not contradict the dogma and AG 7 with the message that every one needs to convert into the present times for salvation. If it does not contradict the dogma then it is irrelevant to the dogma.Why mention it? I hope the Emperor Trajan is in Heaven.Either way it has no bearing on the dogma. We fell for the Richard Cushing error and went in circles with a non issue. I don't know how you think that my "former discussions" are irrelevant. All that I have ever said is that everyone must end his/her life "in the bosom and unity of the Catholic Church." As all salvation is, ultimately, invisible, it is for the Righteous Judge alone to decide who ends his/her life in a state of grace. To end one's life in a state of grace is to end it in the Mystical Body of Jesus Christ, which is the Catholic Church, the Bride of Christ. Irrelevant with respect to there be exceptions, known or unknown, to the dogma. I don't know how you think that my "former discussions" are irrelevant. There were good points raised and meaningful with accepting the baptism of desire etc in principle, in faith. However as exceptions to the dogma they were meaningless since in reality we cannot know any of these cases. I do not believe in exceptions. Period. Nada, none. I hope that I have made that clear. While the Catholic Church is visible, all salvation is invisible, so while we can see the former, we cannot see the latter. With respect to the latter, all must end their lives "in the bosom and unity of the Catholic Church." No exceptions.